Last year, part of my excitement about the holidays was based on the expectation of the BBC’s new adaptation of And Then There Were None, one of my favourite – and certainly one of the best – Agatha Christie novels. The new adaptation did not disappoint. It was hugely successful and actually worth the hype. This year, the BBC is aiming to repeat last years feat with a new adaptation of another Agatha Christie story – another favourite of mine: Witness for the Prosecution. There is something very special about the story, originally written in 1925. It is full of suspense to keep you on the edge of your seat and a few twists that prove why Dame Agatha still is the best known mystery crime writer. 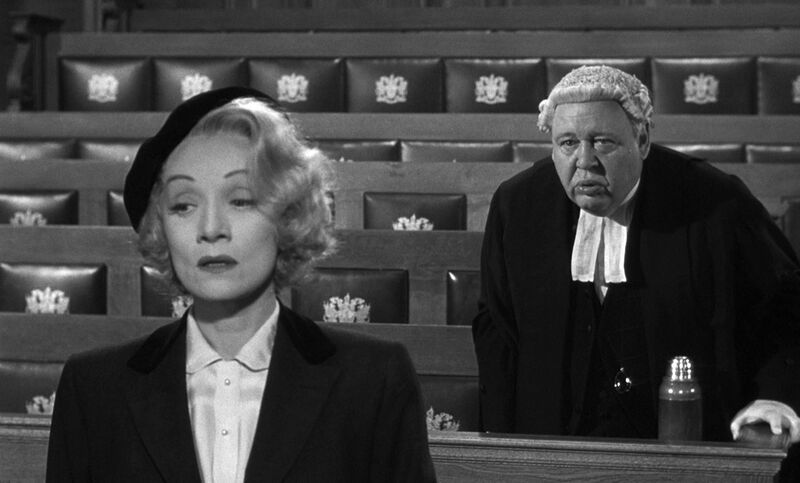 Marlene Dietrich, Tyrone Power, Charles Laughton, Elsa Lanchester – they set a very high bar (pun intended) for anyone attempting to re-create the original court room drama. I guess, we will see what the new adaptation brings to the table. Is anyone else looking forward to this? I finished watching the conclusion tonight. If you are planning on watching it, son’t put your hopes up too high. I would say the new BBC adaptation is “loosely” based on the short story, but they managed to put a lot of emphasis on an additional context that is not part of the original story. Unfortunately, the “new” context – also in line with the period setting in the 1920s – took over the story somewhat. It was not my cuppa. As for the casting, there was some great acting but David Haig did not make a convincing Sir Charles. I like David Haig, but he did not fit in here. Also, they stayed closer with the story in that Toby Jones took on the role of the solicitor, Mr. Mayherne – tho for some odd reason they changed his name to “Mayhew”….. So, while Jones got more screen time that Haig, he was not involved in the court room scenes (as he was only the solicitor). Kim Catrall didn’t get the main part, either. She played Emily French, but she played her exquisitely. Romaine was played by Andrea Riseborough. She was also very good. Her Romaine was rather aloof and distant, not at all similar to Dietrich’s character. It worked but it was lacking the intensity of Dietrich, but then they changed some of the plot…. I’m going to have to figure out when this will be aired in the U.S.! I’d love to see it! I most definitely am … even if I’m likely going to catch it with a bit of a delay! I have my doubts. Catrall is great, but no MD. And Toby Jones is also great, but no CL. I kinda hope they find a different angle to portray the story. Their only chance. If they try to duplicate what’s already there, they’re sure to be measure up to the original … and found wanting. I may need to update this post on Tuesday….We’ll see how it goes.